Why do Kids Throw Tantrums? Young kids throw tantrums, but older ones usually do not. Why is this? Is it that kids feel emotions more strongly? Not the case, as it turns out. Kids do not grow out of emotions, but they do learn better communication strategies for expressing them. Tantrums are fundamentally a communication attempt. Just think: how many toddlers have tantrums when no-one is around? Many of the same needs that cause tantrums in children lead to assertiveness and self-confidence in adults. Are Kids Using Tantrums to Manipulate You?? 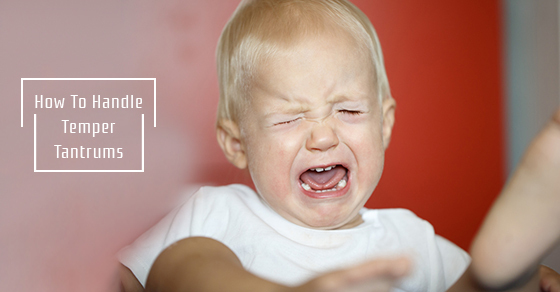 We know it’s hard not to take a tantrum personally. The same behavior from an adult would be genuinely abusive. Kids do learn to influence and pressure adults, but they’re not subtle about it. They know that expressing sadness or anger will often lead to adults giving them what they want. However, kids are not trying to publically embarrass you, shame you, get you fired, or hurt you. They’re not thinking about the big picture — they simply want to be heard. In fact, many child psychologists think that tantrums thrown with a nanny present are a sign of trust: the child believes you care about his or her feelings. Any physical need not being met: being tired, hurt, over-stimulated, sick, hot, cold, hungry, or otherwise. This one is easy — wait out the tantrum, then try to fix what caused it by putting the child to bed, finding the child a blanket, making some food, etc. Trying to complete a task and failing. It can be frustrating to be a kid. Often kids understand how to do a task in theory, but cannot make their hands do it in practice. Little things like zipping up a coat or putting on shoes can be a major challenge. The thing to remember here is that what the child wants is a process: understand the task, do the task, feel good about the accomplishment. Try to distract the child with a game or task that they’ve already mastered. Wanting something and not getting it. This one is a little harder because you can’t give a child everything. Ride these ones out and hold firm. How you dialogue with the child is crucial. Standing over them, wagging your finger and using your “scary” voice should not be your go-to method. Instead, getting to their level, making eye contact, a gentle but firm voice will make a world of a difference. Reasoning with the child will also prompt them to verbalize their thoughts. If the child is upset that a toy is being played with by their sibling, kneel or sit by their side and talk it out. Threats should not be in your arsenal, but explaining the consequences of actions should be. Poor behavior will result in play dates being cancelled, treats being withheld, additional chores to be completed, times out or even conversations with the parents. Ultimately, once a tantrum starts, it’s going to run its course. Your job is to show that you understand the emotions being conveyed, and learn why a child is getting upset. Remember that tantrums happen to everyone. Most importantly, you shouldn’t be intimidated by a tantrum! Yes, you can dread it (everyone does) but resorting to bribery or giving in to demands will only wreak more havoc for you and the child. Just because the child is having a tantrum doesn’t mean you’re not a bad nanny, or bad at your job, if they happen when you’re around. Keep calm and nanny on!